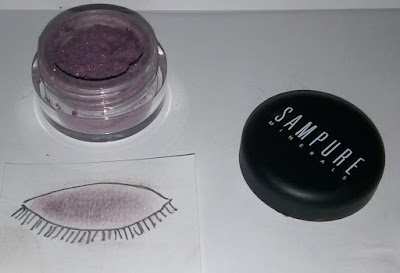 SAMPURE MINERALS Crushed Mineral Eyeshadow, winner of the "Natural Health" magazine award for Eyeshadow, was another lovely blogger's gift I received in my goody bag from the Allergy & Free From Show. It comes in a nice little pot and looks like small granules (similar to my favourite instant coffee!). My sample was in Grape, a soft purple shade. SAMPURE suggest applying it with a finger or a brush. I found it easiest to pat it on to my eyelids with my finger and then blend it. Initially, I used too much and when blended it spread so far that I looked panda-eyed! I realized that a little bit went a long way and tried again with a tiny amount. This time I was successful and it looked really good, with a soft, smooth finish. I found that it stayed on well too. SAMPURE also suggest using the eyeshadow wet, to get a more intense colour or even to use it as an eyeliner. The next day I was more ambitious and after applying the eyeshadow dry, I tried mixing a little with a damp brush and painting a line round my eyes. I was very pleased with the result - a soft purple line in a deeper shade than the shadow. I was delighted with Grape, which really suited me but there are 8 shades to choose from. SAMPURE MINERALS Crushed Mineral Eyeshadow is made from natural ingredients and free from animal products, harsh chemicals or parabens. SAMPURE intend it for use by people who have sensitive skin or allergies but, as always, I would recommend checking the ingredients. It is also Halal, Vegan and Vegetarian Certified and Cruelty Free. Designed to meet so many needs, I think it is very reasonably priced at £9.50. As it happens, right now there is a SALE on SAMPURE's website and they are offering the eyeshadow at £4.75 (half price}! In my next post - a colour that I like at this time of the year.